Within Temptation is a Dutch symphonic metal band founded in April 1996 by vocalist Sharon den Adel and guitarist Robert Westerholt. They have always been classified by critics as gothic metal, although the "gothic" influence varies with each album. Their most prominent and well-known sound is described as symphonic metal, although their earlier material, such as debut album Enter, was mostly gothic metal, with Enter also having a hint of doom metal. In an interview, den Adel said they fell into a symphonic rock genre with various influences. In a later interview with Dutch music platform 3VOOR12, den Adel stated that "we consider ourselves more a symphonic rock band ... in my opinion, we are no gothic band". Within Temptation at the Paradiso, Amsterdam, 2011. Long-term partners Robert Westerholt (guitar) and Sharon den Adel (vocals) began the band in 1996, after Westerholt left his previous band, The Circle. The Circle renamed themselves Voyage and released an album called Embrace, including a song featuring den Adel. Soon after that release the band broke up. Lead vocalist Sharon den Adel at the 2004 M'era Luna Festival. Rapid orchestral strings move to the forefront on the chorus of this title track from Within Temptation's second album Mother Earth. 2001 saw a number of changes in personnel; Ruud Jolie was added as a second guitarist, drummer Ivar de Graaf was replaced by Stephen van Haestregt, and Martijn Westerholt (suffering from infectious mononucleosis) was replaced by Martijn Spierenburg. Westerholt later started the band Delain. The band presented at several big European festivals, which led the band to perform to great major audiences. Plans for the band's third album came to fruition in 2004, with the release of The Silent Force on November 15, 2004, across Europe. It was produced by Daniel Gibson and an instant No. 1 in the Netherlands and charted well in many European countries. In support of the release they embarked on another large international tour in 2005, with dates across Europe (including their first festival appearance in the United Kingdom headlining the Bloodstock festival) and a one-off show in Dubai. As of early 2005, the album had already sold more than 400.000 copies only in Europe. "Stand My Ground" and "Memories", the first singles from the new album, continued the band's run of chart success, culminating in a second Edison Award. The third single was "Angels". "Stand My Ground" was later to be promoted on the trailer for the film Blood and Chocolate. The band also provided some of the soundtrack to the video game Knights of the Temple: Infernal Crusade released in March. In January 2006, Within Temptation won the Dutch Pop Prize (best Dutch contribution) and Dutch Export Prize (best-selling Dutch artist outside the Netherlands); the latter one given to them for the third time in a row. The band also reported that they were busy working on their next album, due to be released during the fall and that they would start playing at festivals starting in April, in addition to going on an international tour at the end of the year. Although already being successful in Europe, it was not until August 5, 2008, that both Mother Earth and The Silent Force albums were released in the North American market for the first time, through Roadrunner Records. The band longest line-up, as pictured in 2007: Jeroen van Veen, Stephen van Haestregt, Ruud Jolie, Martijn Spierenburg, Sharon den Adel, Robert Westerholt. Within Temptation at the 2008 edition of the Bevrijdingsfestival, in Groningen, Netherlands. On November 3, 2008, Ruud Jolie stated on his blog, that the members of Within Temptation were going to take a year off, writing that "After the Theater Tour, that will start next week, me and the rest of Within Temptation are gonna take a whole year off. For the last 7 years, we've been hopping from studio to tour bus to airplane to boat to studio again to tour bus to bicycle to airplane to an occasional swimming pool on the top of a hotel to tour bus again. We all really needed a break from the band..." From that tour, On August 11, 2009, on their official website, Sharon announced that an acoustic album would be released in late October/early November called An Acoustic Night at the Theatre. It would include several acoustic songs from their tour in November 2008. On the 30th of October the album was released, the single was released with the album called Utopia. The song is a duet between Sharon and Chris Jones and was released on October 23. On November 18, 2010, the band announced via their website that their new album, entitled "The Unforgiving" would be released in March 2011. [needs update] The concept of the album would be based on a comic book series, written by Steven O’Connell (BloodRayne & Dark 48), and illustrated by Romano Molenaar (Witchblade, Darkness and X-Men). Each song on “The Unforgiving” was written along Steven’s narrative, with characters in the songs reflecting the protagonists of the comic. On July 26, 2010, the band announced that they would be embarking on a European tour at the beginning of 2011 in support of their new release. However, on November 26, 2010, it was announced that due to Sharon's third pregnancy, the tour dates would be moved from early 2011 to fall 2011. Stefan Helleblad (pictured) took Robert Westerholt place during Within Temptation tours (starting from The Unforgiving Tour to date), enabling Westerholt to raise his and den Adel's children at home. On 14 March 2011, Sony BMG organized an online-listening session of the-upcoming-album on a Polish website that only people from Poland could access. However, every song was soon after leaked onto the Internet. Within Temptation tried to prevent the leak before the release date. Limited promotion CDs were sent strictly to journalists who had to come to a listening session. Later that month, the second short film entitled "Sinéad" was released without an accompanying music video. However, it is available on the special edition CD/DVD set of The Unforgiving along with the remaining short film "Triplets" and music video for "Shot in the Dark". During the album promotional phases, the birth of Logan was reported on the Within Temptation website. Within Temptation in 2012 performing at the Sofia Rocks Festival, Bulgaria. Proceeding on promotion of the album, the band presented at the Sziget Festival, but The Unforgiving Tour officially started August 12, at the Huntenpop Festival, where the band played the whole The Unforgiving album among other albums hits, in a special show as "The First Challenge". During August, the band performed at several Summer Festivals as M'era Luna and Lowlands and started an indoor tour in September, first in the North America and then crossing Europe. In early September, the album reached Gold status in Poland. Later that month, it was announced that Robert would step down touring with the band (except for occasional shows) as there was no-one to look after Robert and Sharon's three children. Robert will focus on production and songwriting, while Stefan Helleblad is taking his place on stage. Ending the year, Within Temptation was the 91st most listened band worldwide in 2011 on the scrobbling site Last.fm, with 90.000 new listeners, the 18th in Russia, 23rd in Poland, 41st in Finland, 56th in Germany, 79th in Brazil and 90th in Chile. In early 2012, to continue promoting the album, the band started a South American tour, passing over Brazil, Chile, Argentina, Peru and Ecuador. Right after coming back to Europe, the band presented a semi-acoustic Dutch theater tour in March 2012, called Sanctuary, much like their previous live album An Acoustic Night at the Theatre in which they played many songs never played before like Say My Name, The Last Dance, Overcome, Bittersweet and some that they don't play often like Restless, Sounds Of Freedom, The Swan Song and Our Farewell. Most of them were played in acoustic version. On the 8th of May, 2012 Sharon den Adel and Ruud Jolie appeared on DWDD Recordings to perform an acoustic cover of Nirvana's song Smells Like Teen Spirit. The band embarked on a second leg of festivals, headlining several of the biggest European 2012 Summer Festivals, such as Sonisphere, Masters of Rock, Rock Werchter, Summerbreeze and Gods of Metal. Later, the band officially announced a very special show called Elements. The sold out special show celebrated the band's 15 year anniversary at the Sportpaleis, Belgium, and the band was accompanied by the Il Novecentro Orchestra and other special guests, such as band's ex-members. The band performing at the 2014 edition of the M'era Luna Festival with a Hydra-themed stage. 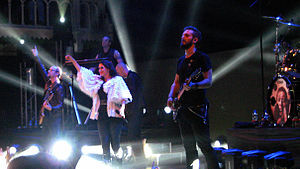 In the run up to the 15th anniversary of Within Temptation, the band was asked by Belgian radio station Q-Music to choose and perform an existing track in a "Within Temptation style" once a week during fifteen weeks during their special program Within Temptation Friday. The covers consist most part of pop songs in which the band transformed into a more symphonic oriented form. Lead vocalist Sharon den Adel stated that:“Our approach was to really make the cover a new Within Temptation song. So not going the easy way by using only a piano or an acoustic guitar for example, but really trying to put all the elements of a Within Temptation track in this new version. It was quite a challenge because we had only one week to get it right, while recording an original Within Temptation song can sometimes takes up half a year! But this pressure also gave us an [sic] creative boost and it was very rewarding to get it done in time each week. Also, we learned a lot from the in-depth analysis we needed to make on these hits, written by others, in combination with implementing our own sound and style in each new cover. We are glad that we’ve taken up this challenge and are very proud of the result." They covered artists such as Imagine Dragons, OneRepublic, Lana del Rey, The Who among others. On April 19, 2013, 11 of the 15 covers made by the band were them released in a cover album entitled The Q-Music Sessions. On the same day, the band released the official music video of their cover of Titanium. den Adel and Helleblad at the 2015 Wacken Open Air. To promote the album, the band embarked on their Hydra World Tour, which was originally planned to start in January 2014, but then was postponed so the band could polish the songs more before releasing the album and had a try-out show at the Effenaar, in Eindhoven, NL, in which sold out on the same day it was put on sale. The first official show happened on 26 February, in Helsinki, Finland, and the arena tour passed primarily in Europe, abranging a few summer festivals. Due to the great reception of Hydra in the United States, the band decided to tour again in North America, travelling from West to East coast and passing over twelve cities, being two in Canada and having some venues with sold out tickets. On 2 May, the band announced through their Facebook page that they were going to record the concert at the Heineken Music Hall, Amsterdam, and the great part of the concert later appeared on the DVD Let Us Burn - Elements & Hydra Live In Concert together with some parts of the previous tour Elements 15th anniversary show. As the end of the European leg, the tour had an attendance of over 120.000 people. On the 3rd of November 2017, the band changed their website and social media to display only a message announcing that a statement from Sharon den Adel would be coming soon. A video statement appeared 7 days later, in which Sharon announced a new solo project entitled "My Indigo". The project came by a writer's block she had while starting to composing new songs for the band's next album, besides also dealing with personal problems, which led her to get some time apart from the band and compose for herself. Later, she decided to release these songs publicly via the aforementioned project. During this process, she regained inspiration to write again for the band, and songs for a new Within Temptation album are currently in the demo phase, with new material to be released in 2018. At the end of November, the band announced a European tour for the end of the next year. At the beginning of December, almost a year before the tour, two concerts were already sold out. In July 2018, Within Temptation signed a new recording contract with Vertigo Records Germany, which will release their seventh studio album worldwide except in Japan. The album, titled Resist, was announced through Metal Hammer magazine and released on February 1, 2019. A single from the album, titled "The Reckoning" and featuring Jacoby Shaddix, was released on September 14. The music video for the song marked the first time the band got nominated again for the Edison Award since 2005. The second single from the album titled "Raise Your Banner" and featuring Anders Fridén, was released on November 16. The third single titled "Firelight" and featuring Jasper Steverlinck, was released on November 23. The fourth single "In Vain", was released on January 11, 2019. A music video for "Supernova", a song off of the album, was released on February 5, 2019. For a time, gothic visual was a common part of Within Temptation's style, as the gothic metal influences were part of their sound, mainly in their early years. Sharon den Adel wearing a nightclub jacket while performing The Unforgiving's Sinéad in 2011. With the release of The Heart of Everything, in 2007, the specialist critics were divided on the band's new direction Others appreciated the new direction and found it more varied. About.com agreed with both opinions, stating that ", the depth and complexity of classical music and the dark edge of gothic metal." allMusic commented that the band "isn't afraid to get downright symphonic". In order to celebrate the band's 15th anniversary, the Belgian radio station Q-music invited the band to make 15 covers of famous songs. Later, the band released The Q-Music Sessions album, the most divergent genre variation from their original sound to date. The album features reworked covers of several famous pop songs, such as "Titanium" by David Guetta featuring Sia, "Grenade" by Bruno Mars, "The Power of Love" by Frankie Goes to Hollywood and also some indie and folk rock songs as The Who's "Behind Blue Eyes" and Passenger's "Let Her Go". The name of the band's sixth studio album, Hydra, refers to this great variation in the band's main sound, as Westerholt said: "'Hydra' is a perfect title for our new album because like the monster itself, the record represents the many different sides of our music.” American magazine Aquarian Weekly considered the title highly appropriate and compared it to the band's diverse musical history, alleging that they were able to find the right balance between all the musical changes and, during the following tour, the sextet was also referred to as "a band that defy stereotypes". Within Temptation current touring Line-up. From left to right: van Veen, Jolie, Spierenburg, Coolen, Helleblad, den Adel. Within Temptation longest line-up, from left to right: van Haestregt, van Veen, Jolie, den Adel, Spierenburg, Westerholt. ^ Giuseppe Abbinante. "Within Temptation - The Heart of Everything". Metallized (in Italian). Retrieved 16 August 2018. ^ Wu, Samantha. "Within Temptation – Hydra – Album Review". Lithium Magazine. Archived from the original on 4 December 2014. Retrieved 29 November 2014. ^ a b c d Within Temptation. "Official Biography". Archived from the original on August 13, 2007. Retrieved 2007-05-12. ^ a b "Within Temptation at NME". Nme.com. Retrieved 2010-04-15. ^ "Artists :: Within Temptation". MusicMight. 2008-02-07. Archived from the original on 2012-10-17. Retrieved 2010-04-15. ^ "Within Temptation at allmusic". Allmusic.com. Retrieved 2010-04-15. ^ "Live Metal interview Within Temptation's Sharon den Adel: A second youth". 2007-05-13. Retrieved 2007-12-20. ^ "3VOOR12 Interview – Within Temptation: muzikale vernieuwing als drijfveer" (in Dutch). 3voor12.vpro.nl. 2008-12-03. Archived from the original on 2009-05-10. Retrieved 2010-04-15. ^ "Conamus Exportprijs". Archived from the original on 2006-05-04. Retrieved 2007-05-12. ^ a b c "Within Temptation". En.within-temptation.com. Archived from the original on 2010-04-13. Retrieved 2010-04-15. ^ "Faster & Mother Maiden short film". Within Temptation. Retrieved 2011-08-20. ^ "Within Temptation @ De Wereld Draait Door (ENG SUB)". YouTube. 2011-08-11. Retrieved 2011-08-20. ^ Records, Roadrunner (2011-07-12). "Within Temptation: 'The Unforgiving' Concept Album Coming March 2011". Roadrunner Records. Retrieved 2013-11-13. ^ Nl, Nu (2016-04-06). "Within Temptation wint Buma Rocks! Export Award". Nu Nl. Retrieved 2016-04-06. ^ Andre (18 February 2005). "Dynamo Open Air 2005". Dynamo Open Air. Archived from the original on 13 April 2010. Retrieved 9 December 2014. ^ Farrell, Charlie. "Within Temptation at Musical Discoveries". Retrieved 2007-05-12. ^ Bijl, Peter. "Utrechts metaltrots Orphanage uit elkaar". Archived from the original on March 22, 2006. Retrieved 2007-05-01. ^ a b Steffen Hung. "Mother Earth in the Dutch Charts". Dutchcharts.nl. Retrieved 2010-04-15. ^ Steffen Hung. "Ice Queen in the Dutch Charts". Dutchcharts.nl. Retrieved 2010-04-15. ^ Steffen Hung. "Within Temptation – The Silent Force". dutchcharts.nl. Retrieved 2010-04-15. ^ "Within Temptation: 'The Silent Force' Certified Gold In Finland". Blabbermouth.net. 2005-08-14. Retrieved 2013-11-13. ^ "Within Temptation provide knights of the temple video game soundtrack". mobygames.com. Retrieved 2010-04-15. ^ "BLABBERMOUTH.NET – WITHIN TEMPTATION Receive Awards For Success At Home And Abroad". Roadrunnerrecords.com. Archived from the original on 2009-05-09. Retrieved 2010-04-15. ^ "Roadrunner Records". Roadrunner Records. Retrieved 2010-04-15. ^ Steffen Hung. "Within Temptation - The Heart Of Everything". dutchcharts.nl. Retrieved 2012-11-16. ^ "Brand new single for Within Temptation". Side-line.com. Archived from the original on 2009-05-10. Retrieved 2010-04-15. ^ "BLABBERMOUTH.NET - WITHIN TEMPTATION: 'Black Symphony' DVD Certified Gold In Holland". Legacy.roadrunnerrecords.com. Archived from the original on 2012-07-10. Retrieved 2012-11-16. ^ a b ""The Unforgiving" concept wins "Buma Music in Motion" award". Within Temptation. Archived from the original on 2011-09-28. Retrieved 2011-08-20. ^ "Within Temptation – Interview @ Appelpop (Tiel) 13.09.2008". Metal Ways. Retrieved 2010-04-15. ^ "Sharon: Important news". Within Temptation. Retrieved 2011-08-20. ^ "Sharon: Three in one". Within Temptation. Archived from the original on 2011-07-19. Retrieved 2011-08-20. ^ "Metalmarketing's Journal – Within Temptation - "The Unforgiving" –". Last.fm. Archived from the original on 2011-02-26. Retrieved 2011-08-20. ^ "Blacky is out, Mike is in!". Within Temptation. Archived from the original on 2013-06-12. Retrieved 2011-08-20. ^ "WITHIN TEMPTATION The Unforgiving music reviews and MP3". Metalmusicarchives.com. Retrieved 2011-08-20. ^ "Official site of Within Temptation". Within Temptation. 2011-08-16. Retrieved 2011-08-20. ^ Steffen Hung. "Within Temptation - The Unforgiving". dutchcharts.nl. Retrieved 2011-08-20. ^ "Faster (radio edit) by Within Temptation - Song Analysis - ITunes Music Chart Archive". Music-chart.info. Archived from the original on 2011-04-01. Retrieved 2011-08-20. ^ "Faster by Within Temptation - Song Analysis - ITunes Music Chart Archive". Music-chart.info. Archived from the original on 2011-07-13. Retrieved 2011-08-20. ^ "The Unforgiving – Within Temptation – Descubra músicas na Last.fm". Lastfm.com.br. Retrieved 2011-08-20. ^ "Official videoclip: Sinéad". Within Temptation. Archived from the original on 2012-08-15. Retrieved 2011-08-20. ^ "To tour again". Within Temptation. Archived from the original on 2011-08-16. Retrieved 2011-08-20. ^ "Within Temptation - Facebook post". Retrieved 2011-10-24. ^ "Robert to focus on song writing and production". Within Temptation. Archived from the original on 2011-10-01. Retrieved 2011-10-03. ^ "Best of 2011 - Principais artistas – Last.fm". Lastfm.com.br. Archived from the original on 2012-04-18. Retrieved 2012-11-16. ^ "Best of 2011 - Principais artistas – Last.fm". Lastfm.com.br. Archived from the original on 2014-03-05. Retrieved 2012-11-16. ^ "On tour". Within Temptation. Archived from the original on 2012-11-22. Retrieved 2012-11-16. ^ "Tour archive". Within Temptation. Retrieved 2012-11-16. ^ "Elements Sold Out". Within Temptation. Archived from the original on 2013-01-05. Retrieved 2012-11-16. ^ WTofficial (2012-05-09). "Announcement: 15 year anniversary". Within Temptation. Archived from the original on 2012-11-16. Retrieved 2012-11-16. ^ a b "Within Temptation is ready for the next step". Radio Metal. 2012-07-04. Archived from the original on 2013-02-01. Retrieved 2012-11-16. ^ a b "Within Temptation". Within Temptation. Retrieved 2013-10-13. ^ a b "Within Temptation To Release Covers Album". Blabbermouth.net. 2013-03-29. Retrieved 2013-11-13. ^ Frank Janssen (2013-01-28). "Within Temptation tekent bij BMG | Nieuws | Entertainment Business". Entertainmentbusiness.nl. Retrieved 2013-11-13. ^ "News | BMG Music Rights Management". Bmg.com. 2013-01-28. Retrieved 2013-11-13. ^ "Universal Music Publishing - Netherlands". umusicpub.nl. ^ "Twitter / WTofficial: On our way for the 1st videoshoot". Twitter.com. Retrieved 2013-11-13. ^ "11/15/2013 - DTMD2.0 | Within Temptation Fan Site". donttearmedown.info. Archived from the original on 2013-06-20. Retrieved 2013-11-13. ^ "11/15/2013 - DTMD2.0 | Within Temptation Fan Site". donttearmedown.info. Archived from the original on 2013-09-28. Retrieved 2013-11-13. ^ "Check Out The First Bit Of The New Album! - Within Temptation". Facebook. Retrieved 2013-11-13. ^ "Within Temptation Unveil Teaser for New Single + Music Video". Loudwire.com. 2013-07-12. Retrieved 2013-11-13. ^ "Within Temptation: Teaser For New Single, Video". Blabbermouth.net. 2013-07-12. Retrieved 2013-11-13. ^ "Within Temptation: New Single Title, Lyrics Unveiled". Blabbermouth.net. 2013-08-23. Retrieved 2013-11-13. ^ "Restringing my guitars- tomorrow i´ll... - Stefan Helleblad". Facebook. Retrieved 2013-11-13. ^ WTofficial (2013-09-13). "Paradise (What About Us?) featuring…… (read more)". Within Temptation. Archived from the original on 2013-11-18. Retrieved 2013-11-13. ^ "Within Temptation: 'Paradise' Video Featuring Tarja Turunen Released". Blabbermouth.net. 2013-09-27. Retrieved 2013-11-13. ^ "Twitter / WTofficial: end of the first press day". Twitter.com. Retrieved 2013-11-13. ^ "Twitter / WTofficial: end of day 2 .., going home!". Twitter.com. Retrieved 2013-11-13. ^ "Metal Hammer | Louder". Archived from the original on 2013-12-16. Retrieved 2014-02-08. ^ Steffen Hung. "Dutch charts portal". dutchcharts.nl. Retrieved 2015-08-04. ^ ds. "Čns Ifpi". Ifpicr.cz. Retrieved 2014-08-16. ^ "WT for the first time ever on the UK Top 10". Official Charts Company. Retrieved 2014-02-09. ^ "Within Temptation's 'Hydra' Cracks U.S. Top 20". Blabbermouth.net. 2014-02-12. Retrieved 2015-08-04. ^ "Within Temptation Postpone European Tour". Soundscape Magazine. 2013-10-06. Archived from the original on 2014-02-03. Retrieved 2015-08-04. ^ "Hydra Try Out Show – Sold Out". Within Temptation. 2014-01-30. Archived from the original on 2014-10-06. Retrieved 2015-08-04. ^ "North American tour announced". Blabbermouth.net. 2014-03-31. Retrieved 2015-08-04. ^ "Within Temptation to release DVD". Blabbermouth.net. October 2014. Retrieved 2015-08-04. ^ "Cookies op AD.nl - AD.nl". www.ad.nl. ^ a b "Within Temptation's Sharon den Adel Reveals My Indigo Solo Song". Loudwire. ^ "Within Temptation: Sharon Den Adel gründet Soloprojekt My Indigo". ^ "Within Temptation announce UK and European tour". ^ "Within Temptation staat volgend jaar in Afas Live - Stadsgids - PAROOL". Het Parool. ^ "Live Arena - Infos Concerts, Musiques et Festivals en Europe". live-arena.uk. ^ "WITHIN TEMPTATION Announces Fall 2018 European Tour". 20 November 2017. ^ "Within Temptation kondigt twee extra optredens aan - NU - Het laatste nieuws het eerst op NU.nl". www.nu.nl. 2017-12-05. ^ "Within Temptation sign with Vertigo Records Germany". ^ "Edison Pop 2019 nomineert o.a. Nielson, Haevn en Wende". 2018-12-04. ^ musicfolio.com. "Within Temptation Discography - Album / CD Reviews". Retrieved 13 August 2012. ^ metalkingdom.net. "Within Temptation - Enter". Retrieved 13 August 2012. ^ metalstorm.net. "Within Temptation - Enter review". Retrieved 13 August 2012. ^ chroniclesofchaos.com. "Within Temptation - _Enter_". Retrieved 13 August 2012. ^ cduniverse.com. "Within Temptation - Dance CD". Retrieved 13 August 2012. ^ musicaldiscoveries.com. "Within Temptation - album, dvd and ep reviews and artist reflections". Retrieved 13 August 2012. ^ metal-archives.com. "Reviews: Within Temptation - Mother Earth". Retrieved 13 August 2012. ^ tartareandesire.com. "REVIEW: Within Temptation - Mother Earth". Archived from the original on 18 February 2012. Retrieved 13 August 2012. ^ sputnikmusic.com. "Within Temptation - The Silent Force". Retrieved 13 August 2012. ^ "Within Temptation - The Heart Of Everything review - Metal Storm". www.metalstorm.net. ^ sputnikmusic.com. "Review: Within Temptation – Heart of Everything". Retrieved 13 August 2012. ^ about.com. "Within Temptation - The Heart Of Everything". Retrieved 13 August 2012. ^ Prato, Greg (2007-03-12). "The Heart of Everything - Within Temptation : Songs, Reviews, Credits, Awards". AllMusic. Retrieved 2012-11-16. ^ roadrunnerrecords.com. "WITHIN TEMPTATION - The Unforgiving (Special Edition CD/DVD)". Archived from the original on 18 February 2012. Retrieved 13 August 2012. ^ about.com. "CD Review: Within Temptation ~ The Unforgiving". Archived from the original on 18 February 2012. Retrieved 13 August 2012. ^ metacritic.com. "The Unforgiving - Within Temptation". Retrieved 13 August 2012. ^ "Within Temptation: The Unforgiving". Q Magazine (297). April 2011. ^ grumpyrocker.co.uk. "Within Temptation - The Unforgiving Review". Retrieved 13 August 2012. ^ "Codes promo et réductions - LesCodesPromo.com". metalholic.co. ^ WTofficial (2013-11-08). "Pre-order new album HYDRA starts today". Within Temptation. Retrieved 2013-11-13. ^ "An Interview with Within Temptation: The Art Of Balance". ^ "Within Temptation & Amaranthe take over Terminal 5, NYC 10-10-14 - Cryptic Rock". crypticrock.com. 2014-11-07. Wikimedia Commons has media related to Within Temptation.